Warm wooly socks chase the winter chill and keep toes snug and cozy. 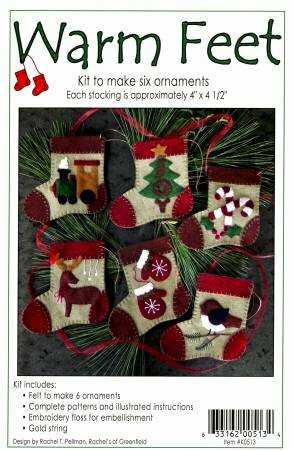 Make them for a tree, or fill them (they are perfectly sized for gift cards or other treasures) and give them as special gifts to family or friends. Design motifs include a stately reindeer, a joyful tree, candy canes, a small brown bird, a train, and a pair of bright red mittens. Red and brown cuffs, toes, and heels with embroidery embellishment add charm. Each mitten is approximately 4" x 4.5".